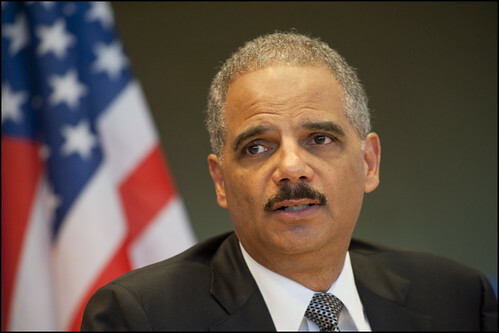 Attorney General Eric Holder delivered a major policy speech at Northwestern University in Chicago that laid out what he and the Obama Administration consider to be the legal justification for counterterrorism policies. Of particular significance were arguments justifying the use of lethal force to kill US citizens suspected of terrorism without charge or trial. I attended the speech. I witnessed how the university sought to position Holder’s speech as a moment of prestige for the university. I heard the tone in Holder’s voice as he espoused his view that all the Obama Administration is doing in the “war on terror” is justified. As the director for the ACLU’s National Security Project stated, the speech was a “gesture towards additional transparency.” The gesture was naïve, designed as a substitute for releasing information, such as legal memos, which the ACLU has been seeking through a Freedom of Information Act (FOIA) request for months now. The Administration once again displayed an unwillingness to admit the targeted killing programs of the United States present fundamental legal and moral questions. The Administration, again, refused to concede the public should be able to see the legal memos explaining why this program is lawful. What makes “lethal force” lawful? All that must be in place is a “process” of “review.” This meets the constitutional requirement that all US citizens “suspected of being a senior leader of al Qaeda or associated forces” be afforded “due process.” Since the “Executive Branch regularly informs the appropriate members of Congress” about “counterterrorism activities, including the legal framework,” the targeted killing program is even more legal. Additionally, the targeted killing operations are “national security operations.” They are not merely law enforcement operations. They are also not simply military operations. They are a hybrid. They are “national security operations,” which grants the Executive Branch carte blanche to tailor the law to provide cover for whatever acts a presidential administration may wish to justify. This was the logic in the address. America is a “nation at war” against a “stateless enemy” that is “nimble and determined. That is the overriding basis for all that is legally and morally repugnant about the targeted killing programs. Some have called such operations “assassinations.” They are not, and the use of that loaded term is misplaced. Assassinations are unlawful killings. The basis wholly ignores Justice Sandra Day O’Connor, who declared in the Supreme Court ruling on the Hamdi v. Rumsfeld case that “a state of war is not a blank check for the president when it comes to the rights of the nation’s citizens.” This was important because it meant that “enemy combatants” do have rights and could challenge their treatment in courts. It was a significant blow to the Bush Administration, which thought an authorized use of military force gave them the power to overrule any legal requirements. The speech superficially invoked international law. The US does not care much for international law. International law constrains US superpower. It suggests the US must abide by a set of legal rules, which could very well subvert the sovereignty of America. Assertions by Obama administration officials, as well as by many scholars, that these operations comply with international standards are undermined by the total absence of any forms of credible transparency or verifiable accountability. The CIA’s internal control mechanisms, including its Inspector-General, have had no discernible impact; executive control mechanisms have either not been activated at all or have ignored the issue; congressional oversight has given a ‘free pass’ to the CIA in this area; judicial review has been effectively precluded; and external oversight has been reduced to media coverage which is all too often dependent on information leaked by the CIA itself. As a result, there is no meaningful domestic accountability for a burgeoning program of international killing. This in turn means that the United States cannot possibly satisfy its obligations under international law to ensure accountability for its use of lethal force, either under [international human rights law] or [international humanitarian law]. The result is the steady undermining of the international rule of law, and the setting of legal precedents which will inevitably come back to haunt the United States before long when invoked by other states with highly problematic agendas. If Targeted Killings Are Justified, What Can’t Be Justified? This argument of legal justification essentially moves the practice of targeted killings one step closer to being fully institutionalized and subsequently makes it possible to justify numerous other practices regarded as clear violations of civil liberties, human rights and the law. …notwithstanding the heated objections of the ACLU and the professional Left, a solid majority of American liberals support the targeted killing of terrorists—even if they are American citizens. (Of course, a majority of liberals oppose capturing terrorists alive and waterboarding them. But blowing them up with drones from the air is just fine. Go figure.) [emphasis added]…. With targeted killings, one can argue against those who have condemned previous abuses of power. One can also argue against expansions of civil liberties protections. The bottom line is the Obama Administration has the support of the two dominant political parties in America. This further solidified the bipartisan national security consensus. The Obama Administration has the support of US citizens. That’s why the speech was given at a law school and not on primetime television. The Obama Administration wanted to send a message to one of the few factions of the population willing to be outspoken no matter the political cost: civil liberties groups, law professors, lawyers and other members of the justice community. It wanted this faction to stop questioning the unprecedented use of lethal force to bring individuals to justice. It may not have worked though because the speech simply renews interest in getting the memo that says it is legal to kill Americans without charge or trial released. Problem here is that while Attorney General Holder acknowledges that the Constitution requires due process before the government takes the life of one of its own citizens, he says it is up to the executive branch alone, without judicial review, to determine what process is due and to make that decision without any oversight. And that’s simply not the case in our constitutional system of checks and balances. The public deserves a right to know what standards, evidence and criteria are used when the administration seeks to kill one of its own citizens, and the legal basis for that exercise of authority needs to be reviewed by the court because of the significant constitutional questions that are raised. That was for the oldthinkers, who have not adapted to post-9/11 era of thinking. The use of the title of Bruce Springsteen’s new song may be ironic and a bit twisted but it is appropriate. Indeed, after yesterday’s speech, America will “take care” of its own if necessary.